The TruckLabor module in TruckSeries helps service professionals estimate commercial truck repair times faster and easier than ever before. You’ll find everything you need to estimate a job in a few clicks, saving time and getting more trucks through your repair shop faster. When you eliminate the guesswork, you work smarter and can write more accurate commercial truck repair estimates with confidence. 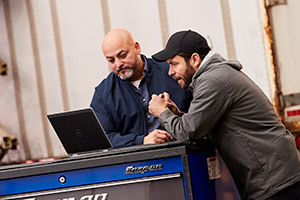 With TruckLabor at your fingertips, you can increase shop throughput and profits by delivering consistent and accurate commercial truck repair estimates to your customers. The commercial truck labor time estimator does more than estimate jobs, it also analyzes technician performance to help you identify where you need to improve. Once you better understand how well your shop is performing, you can take steps to increase velocity. Find all makes and models of Class 4-8 trucks, covering model years 1990 to current in one convenient location, within a single application. No more manually searching multiple databases, so you can save time and increase productivity. Enhance your customers’ experience with professionally formatted commercial truck repair estimates personalized with your customers’ information. The Estimator Tool also allows you to customize labor rates for different customer types or service operations. Every estimate you write will consistently align with your shop’s business goals and objectives, improving your bottom line in the process. The TruckLabor estimating system for Class 4-8 trucks automatically updates commercial truck labor time data and saves your shop’s latest estimates for quick retrieval. You can rest assured knowing your estimates are not only accurate, but secure. The intuitive navigation guides you through the steps to quickly generate an accurate commercial truck repair estimate. First, you’ll identify the vehicle by selecting a year/make/model. Then, choose your labor operations, add parts if applicable, and print the estimate. Many photos used in the TruckSeries products are made possible by the generous support of Universal Technical Institute.